Today I welcome Dayna from Lemon Lime Adventures to our 31 Days of Love series (check out the links to this at the very bottom of this Valentine’s Day post). 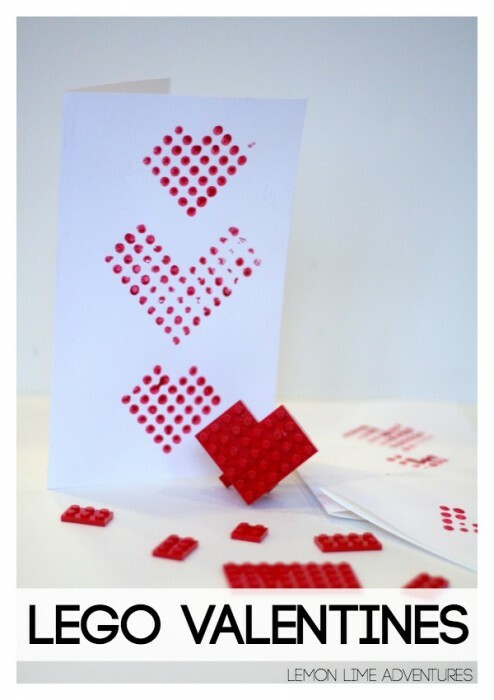 Danya has a great Valentine’s Day Card idea – which I know will particularly appeal to LEGO fans!!! 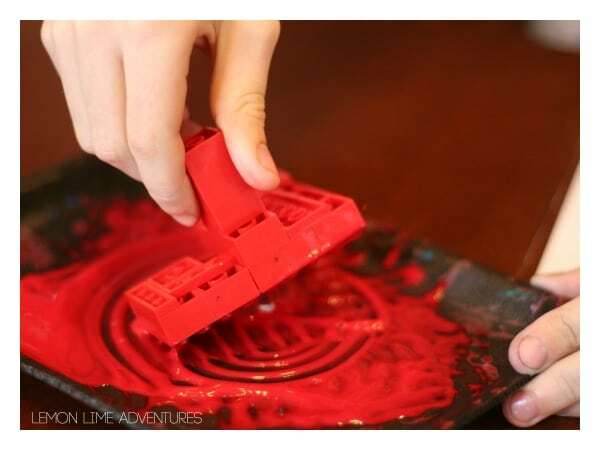 Using LEGO bricks to print with. What a fun idea! 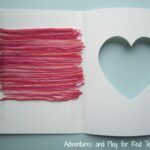 So simple and sweet and yet super effective Valentine’s Day Card! Over to Dayna! Hi, Red Ted Art Readers. I am Dayna from Lemon Lime Adventures and I am more than excited to be sharing with you today. 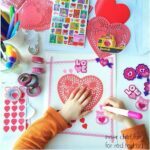 We are huge Red Ted Art fans and had a blast being part of 31 Days of Love last year with our Recycled Heart Mobile. We couldn’t be more excited to be here again to share our latest Lego creation with you, just in time for Valentine’s Day! In our home, we LOVE Lego! 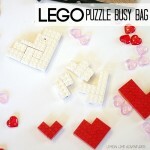 Just the other day, he created these awesome Lego puzzles for Valentine’s Day and turned them into an on-the-go busy bag. After playing with the puzzles for a few days, we wondered what would happen if we used the puzzles to make Lego Valentines. We were pretty pleased with the outcome! 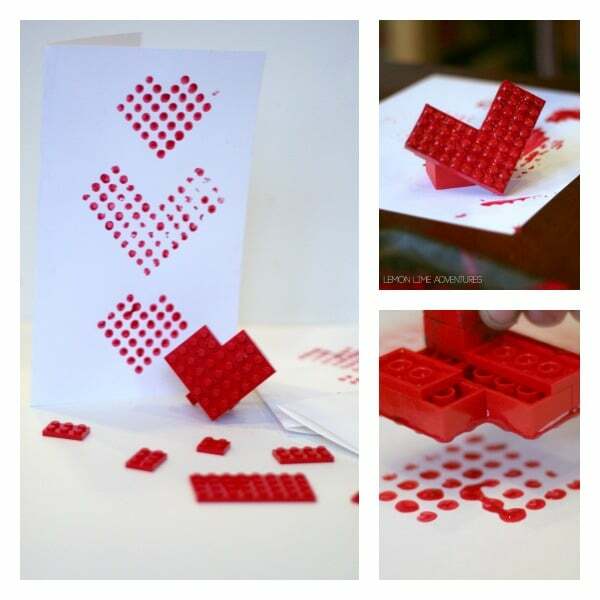 A simple, yet creative Valentine for any Lego lover in your life to receive or create! Creating the Lego hearts is half the fun! 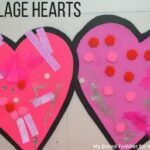 1) Create you Lego hearts in the size and shape you want. We made 3 sizes, with the same design. 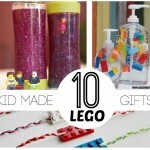 Once you have your Lego hearts made, add a “handle” to the back of the design to create a stamp out of the heart. 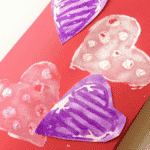 2) Carefully dip the heart into red paint. 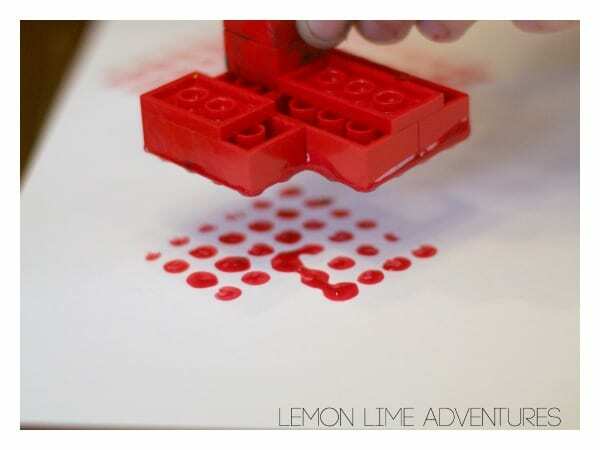 We like to put our paint in a tray so we can spread it out and get the excess paint off the Lego before we stamp it. 3) Very slowly and carefully place your Lego heart in the desired place on the cardstock. Push on the top of the stamp to give it an even look, and then pick the stamp up while holding the paper with the other hand. 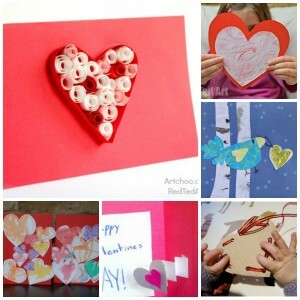 You can make one, two, or even twenty hearts. 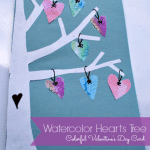 We liked ours with just 3 hearts in a line, but let your creativity take control. 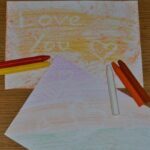 Once your painting is dry, you can fold the paper evenly for a beautiful Lego Valentine that anyone is sure to love! While you have the paint and the Lego out, why not keep the creativity flowing? 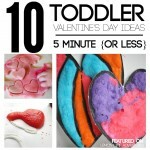 I am sure you can think of tons of things to create with your child when you let creativity take over! 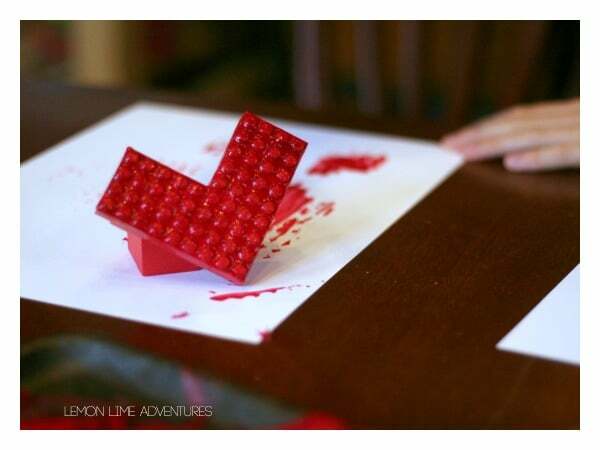 For more Lego and Valentine’s adventures, be sure to check out Lemon Lime Adventures. 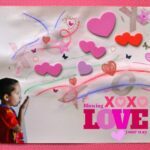 Dayna is a National Board Certified teacher, with over 12 years of experience in early childhood education, who now homeschools her 3 children, one of which struggles with Sensory Processing Disorder. She is the author at Lemon Lime Adventures and owner of Project Sensory, where she is dedicated to sharing real life stories with parents and educators about the pretty and the not so pretty days involved in raising children. You can connect with Dayna over on Facebook, Twitter, Instagram, and G+! I hope you enjoyed Dayna’s super fun LEGO printed cards. So simple, so cute, so fun! 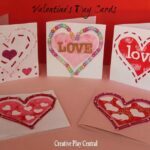 If you are looking for more Valentine’s Day Card Ideas, we have a whole set here from last year? 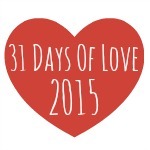 Or do stop by and browse the whole of the 31 Days of Love series here! Thank you so much for having me over! It was so much fun!